Over two feet wide, this adorable cottage has two floors of living space and a full attic to decorate. A wrap-around porch, shutters for the windows and gingerbread trim provide external charm while you provide the perfect interior design with an open back for easy decorating access. 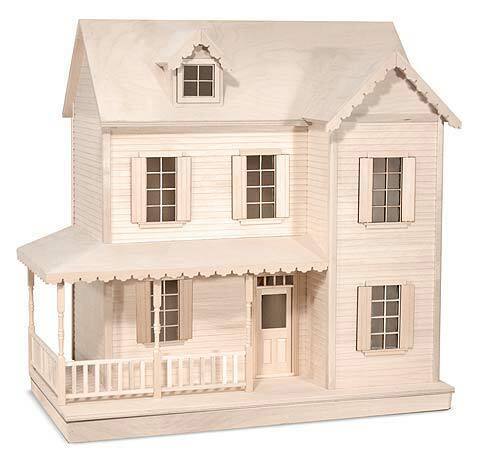 This superior-quality dollhouse comes as natural, unpainted wood, and is ready to be assembled, shingled and decorated by its owner. 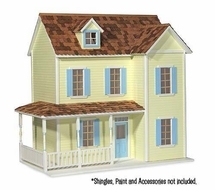 Shingles and paint not included in kit. 1:12 scale.